Ever had the blues? Yesterday one boy had them bad--not just the ordinary blues, the "deep down in my shoes" blues, the "go away Mr. Sun quit smilin' at me" blues. But today he's traded in those blues for greens, the "runnin' my hands along the hedges" greens, the kind of greens that make him want to be Somebody. With text that begs to be read aloud, and bold, colorful paintings, this book will have readers big and small pondering the spectrum of moods and how they can change from day to day. JERON ASHFORD FRAME was given the Ezra Jack Keats New Writer award for this lovely, imaginative, text. She lives near Philadelphia, Pennsylvania, with her family. 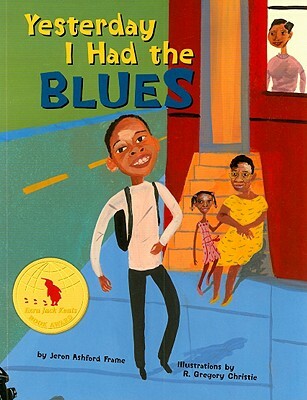 R. GREGORY CHRISTIE is a three-time recipient of the American Library Association's Corretta Scott King Award honor and illustrator of Tricycle Press' A CHANCE TO SHINE. He lives in Brooklyn, New York.